October | 2011 | Quilting my way through life! It’s amazing how quickly these quilt-as-you-go lap quilts come together when you start with pre-cuts! The cutting is practically all done for you. This quilt takes a jelly roll, a charm pack and a yard of fabric for the triangles & binding. You can’t get much easier than that. You can however make your own fabric collection too if you prefer. Instructions are included for that too. Happy sewing and I’ll chat with you when I return from quilt market next week. I decided to update the fabrics in some my favorite and popular patterns. My earliest patterns had hand-drawn illustrations that are accurate, but now that I use the computer for eveything I decided to update that part as well. I couldn’t resist making it in the new Amelia fabrics that I’ve been working with these past few months. It’s so bright & cheery for spring! 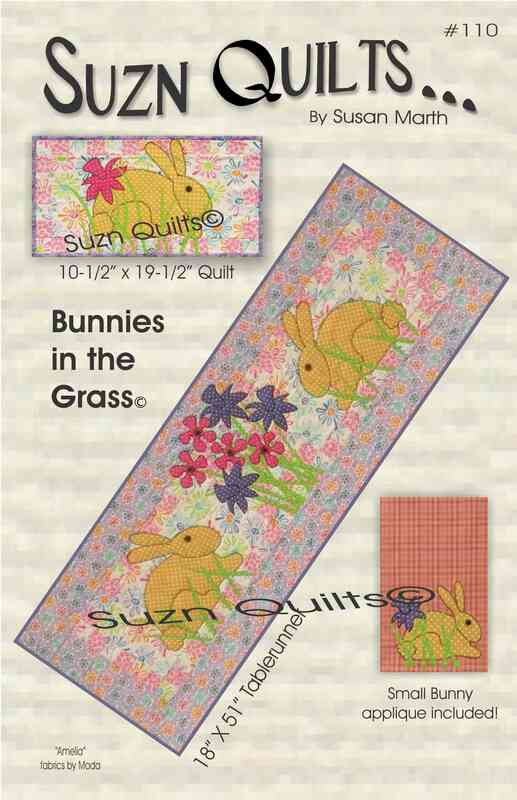 The pattern includes an 18″ x 51″ table runner, a small quilt, plus a smaller bunny applique that is just right for towels or shirts, etc. 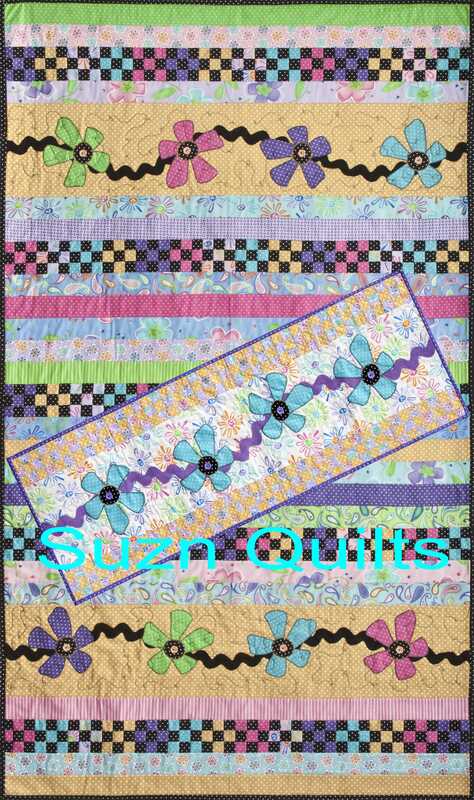 Look for it soon at your local quilt shop or on my website. One more newly updated pattern tomorrow. Wow, time flies when I’m having fun! I enjoy the entire process of making quilt patterns. I love buying the fabric, making the samples, writing the directions, working with my photographer getting the photos just right and then taking them to be printed. It’s almost fun folding and stuffing them into their zip top bags, almost. I find that I spend a fair amount of time in front of the TV waiting on my college-age kids to get home from school, work and play, so that’s when I usually take care of that task. When all that is finally done, I can’t wait to see the finished product in its crystal clear bag, ahh! That shiny clear bag with my pattern inside just makes me smile. The next step is debuting them at market. It’s a bitter-sweet task in itself. There is always travel involved, either to Houston each fall for fall market or to a different city each spring for spring market. After working my bootie off for several months getting new patterns and samples ready then traveling to get them to market where it’s three days of standing all day after a day of set-up and Schoolhouse lectures the day before that, it’s very exhausting as well as exhilarating. It’s fun seeing quilting friends, but it’s very tiring getting “it” all together! For all those traveling to quilt market, safe travels, and come see me in booth #1902! For those of you that cannot attend, stay tuned for photos when I return. This is a lap size quilt, made with my Quilt-as-you-go method that I’ve chatted about here. Bright & cheery for spring don’t you think? It’s been in the works since BEFORE I got back from Salt Lake City’s spring market in May. I love the way it turned out with the Amelia fabrics by Me & My Sister for Moda. The fence posts and the “grassy” area between the fence posts are sewn into strips then the strips are sewn onto the foundation. Next make and fuse the applique. I love the cricket, how ’bout you? This change in the weather can’t come soon enough for me and it’s not even winter yet, although there have been a few days this past week that could have been considered winter days, yuk!!! I will think about spring instead of winter if you please. It’s another pattern made with my popular Quilt-as-you-go lap quilt technique. You may remember if here. It’s made with the new Amelia fabric collection by Me & My Sister Designs for Moda, plus a yellow polka dot print that I couldn’t resist. 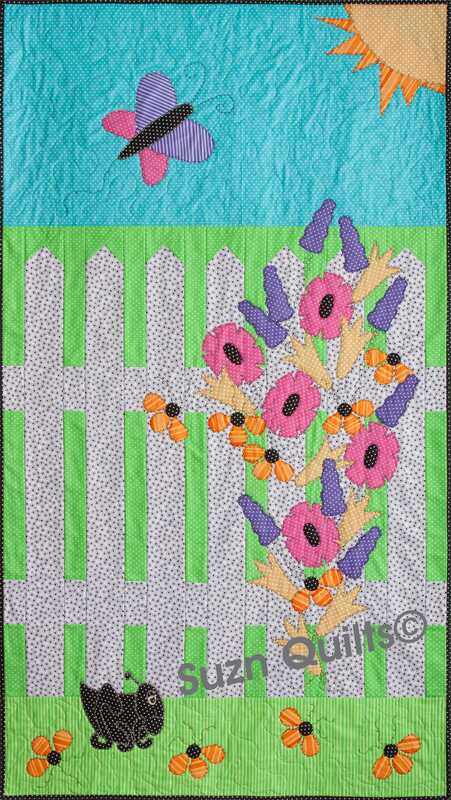 I used a jelly roll plus some yardage for the borders & flower applique to complete the top. It also uses some jumbo rick rack and cute little flower buttons by hillcreek designs. 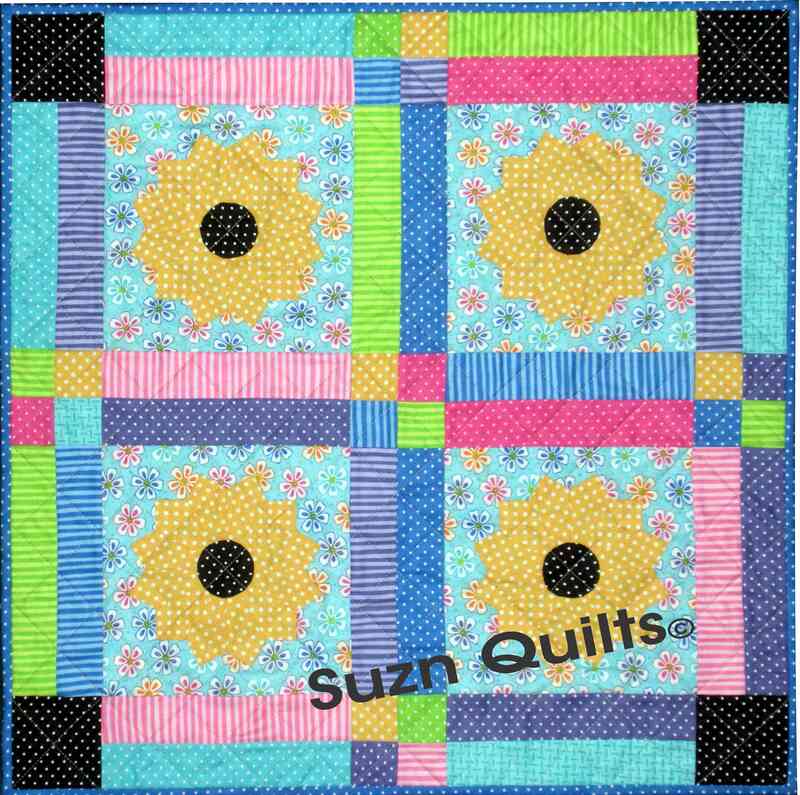 I’m always on the look-out for new, fun stuff to add to my quilts. It’s a project that I can complete in less than a day and the best part is when all of the strips are sewn onto the foundation the quilting is done, no wondering how to quilt it, yeah! You can easily make it in a weekend and these lap quilts make great gifts. Ask me how I know! 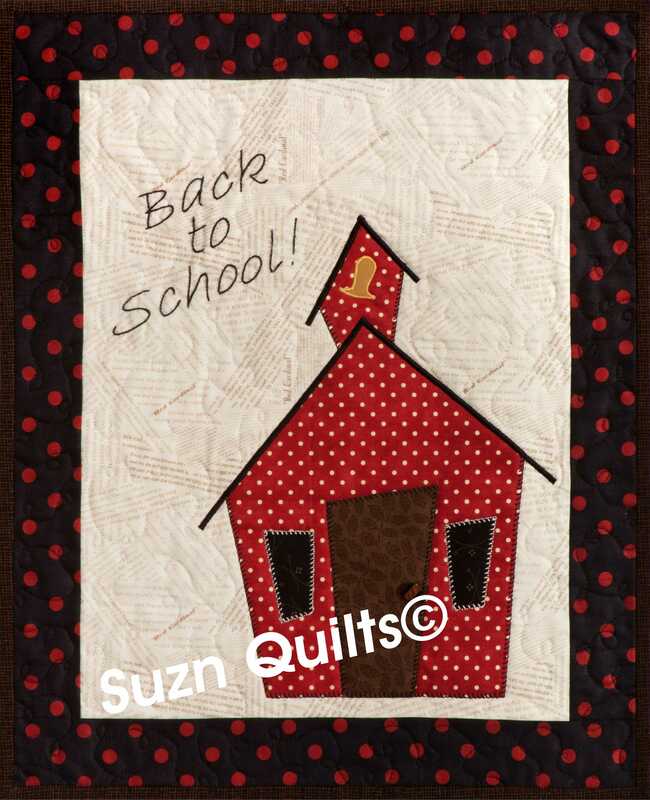 My sixth new “In Season” pattern has to be about school don’t you agree? I will now look forward to hanging this every year in June to remind me that I will once again miss all the craziness of summer, just kidding!!! I finished the sample that I was working on with the “extra” black charm squares from yesterday’s interruption post. Do you remember that chat? Anyway, during the disappointing World Series Game #4, I put the hand stitches on the binding. I like this outcome more than the Cardinals’ outcome. It’s a sample of my new “A Pretty Plate” quilt using my “Mini Dresden Plate Plexi Template” that I introduced at spring market. Notice how I used the black charm squares in the corners instead of more 4 patches? I thought it would tie in the black centers of the Dresden plates. Gotta love the bright spring-like fabrics. Am I the only one that doesn’t enjoy this time of year because I know winter is just around the corner??? I’m so not looking forward to W-I-N-T-E-R!!! Yes, it’s another Amelia fabric sample. It will look nice sitting right close to all the others later this week in my booth at Houston. Hopefully the Cardinals will have a better night tonight. 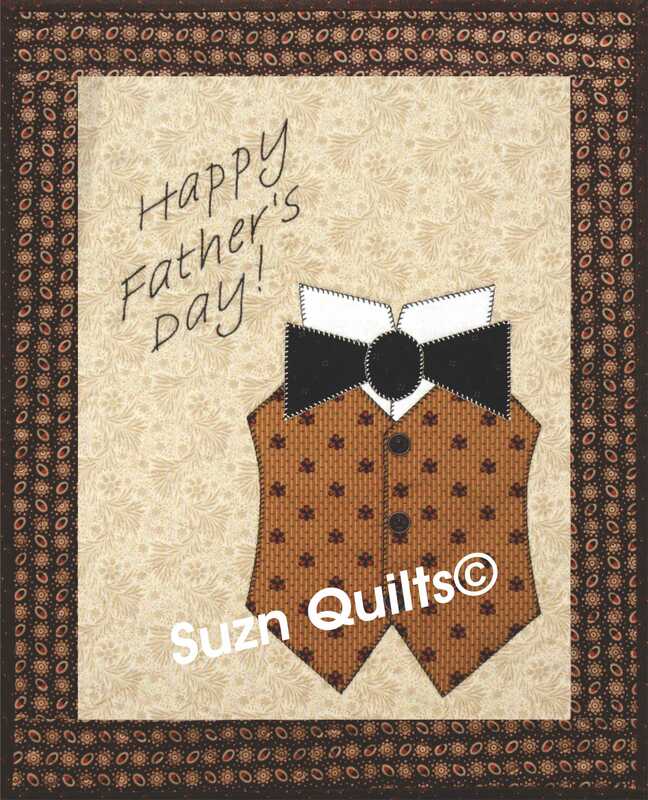 I used civil war prints for the vest & border on this quilt to add a bit of male sophistication. In another life-time (or so it seems looking back) I made applique towels for family, friends & craft shows. Even back then I did a lot of seasonal sewing. My following had towels for pretty much every season, but several asked for something to hang for Father’s Day. That’s when I came up with a vest and bow tie for the month of June. This is a dressed up version!